Seafood doesn’t seem like a natural choice for pizza, but seeing how popular these pizzas are, their fans clearly know something the rest of us don’t. The trick is to find a reliable pizza shop that always uses fresh toppings, because seafood offers a higher risk of tummy problems if it’s handled badly or exposed for too long. 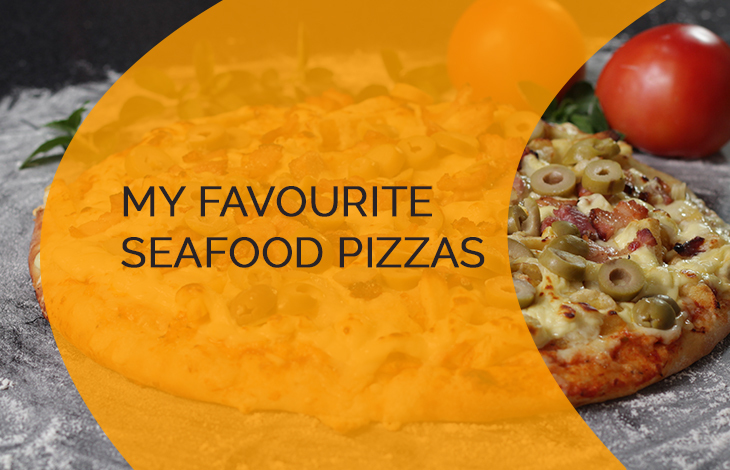 So as we explore the wonderful world of seafood pizzas, here are some options to check out. The name says it all. Keep in mind that certain types of seafood literally need to be cooked alive in order to kill all the potentially harmful toxins in their bodies. These are primarily shellfish like crabs, lobsters, shrimps, and prawns, as well as some other types of seafood, like octopus. This pizza has quite a few items on that list. It has a generous serving of marinated tiger prawns, scallops, and calamari that has been sliced into strips. The seafood is flavoured with lemon, garlic, and selected herbs, as well as sundried tomatoes. There’s no cheese on this particular pizza, but that doesn’t mean you can’t mix cheese with fish. You just have to find the right flavour mix. Speaking of cheesy fish, the garlic prawn pizza has a good sprinkling of feta cheese mixed in with marinated tiger prawns. It makes an interesting combination of textures, pitting the gently gooey melted cheese against the firm bite of baked prawns. The pizza has a regular tomato base, but it also uses cherry tomatoes as a topping. Other vegetables in this pizza include roasted capsicum, which has a slightly sharp edge. Spring onions and garlic finish it off with a touch of lemon. The toppings give this pizza a bright colourful appearance, and the flavour can be quite rich. It’s a good choice is you’re primarily a seafood fan, but if you want to mix and match, you could try a spicy Jambalaya pizza, which has prawns, chicken, chilli sauce, and chorizo (spiced pork sausage). Now that we’ve established seafood works well with cheese, the next step is obviously … more seafood and more cheese. Seafood dishes are often served on their own, but just like a seafood platter, you can combine shellfish varieties to offer a delicious puzzle to your tongue. After all, when it’s served on the same plate, not everyone can differentiate multiple types of shellfish, but for the aficionado, it’s a tasty jigsaw. The Cheesy seafood mix couples crab meat with peeled shrimp. Some people prefer imitation crab meat, but for the real seafood experience, buy your crab fresh – which means if you’re baking the pizza at home, you’ll need to carry a bucket with live crabs and shrimps from the fishmonger. The cheese mix has romano, parmesan, and mozzarella cheese. Garlic and parsley help to bring out these flavours and add a little more kick. Sometimes referred to as pizza pescatore, this pizza is often taken to generically refer to any type of pizza that has seafood on it. It also seems to be a popular name for pizzeria’s in Italy and doing a Google search will get you a long list of page results. Still, in its original form, the fisherman’s pizza is topped with mussels and squid (calamari). Some pizza varieties, like Frutti de mare, add scampi to the mix. Both variants are Italian-style pizzas, which means they are thin and crusty at the edges but thick and spongy in the middle. They are often baked in square shapes, and like all Italian pizza, they should be consumed with fork and knife. Frutti de mare doesn’t usually have cheese in it, but pescatore might. Once in a while, you might find pizza made with regular fish, like salmon or tuna. The fish needs to be very lightly cooked to retain its texture and flavour. At $450, this pizza went down in the Guinness Book of Records as the most expensive pizza in the world. It came from – of all places – Canada, and was baked in a pizzeria called Steveston. They named this seafood wonder was the C6, and they sold a slice at $45. The 12-inch treat was topped with lobster, smoked salmon, tiger prawns, and caviar. You can still order this pizza today, but you have to give the pizzeria 24 hours’ notice. And if you’ve heard of the Haggis restaurant in Glasgow, they have a non-Guinness-approved equivalent called the Pizza Royale 007. Toppings? Lobster, caviar, and leaf made of 24 carat gold. We doubt the leaf is edible, but since you’ve paid $4,200 for the pizza, you can keep it.